Investors added $849 million from U.S. stock mutual funds during the week ended March 13, marking the first inflow after two weeks of modest outflows. After taking a short breather, U.S. investors re-entered the U.S. stock market last week. Investors added $849 million to U.S. stock mutual funds during the week ended March 13, according to the latest data from the Investment Company Institute. That marks the first inflow after two weeks of modest outflows. The return to stocks came in the middle of the Dow's 10-day winning streak, during which the blue chip index also closed at fresh record highs for eight days in a row. So far this year, investors have put roughly $20 billion into U.S. stocks. International stocks are also drawing strong interest. In the latest week, international stock funds attracted more than $3 billion, bringing the year-to-date tally to more than $40 billion. Bonds, which are perceived as less risky than stocks, continued to lure in investors as well. 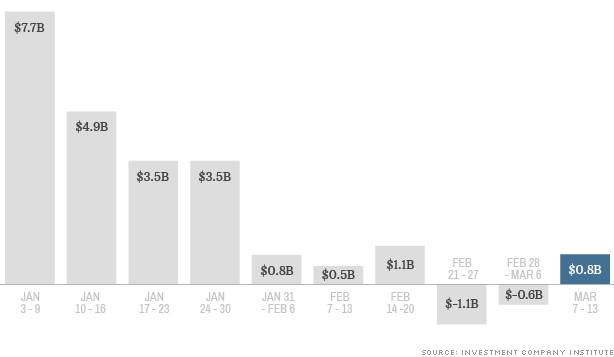 Bond funds took in $1.6 billion, bringing the year's total to just over $60 billion. Hybrid funds, which invest in both stocks and bonds, brought in $2.1 billion last week.